UPDATE: Just as we suspected, Epic CEO Tim Sweeney has confirmed Epic Games paid Ubisoft to prevent keys for The Division 2 from being sold on third-party sellers. "Ubisoft agreed to a co-exclusive on UPlay and the Epic Games store," said Sweeney on Twitter. "Epic Games seeks exclusive games in order to have a unique lineup of games so there’s another reason for gamers to come to our store." Sites such as Humble, Green Man Gaming, GamesPlanet, GamersGate, and more, were all forced to remove their keys for Tom Clancy's The Division 2 on its March 15th launch day. Somewhat ridiculously, this change only affects officially recognised resellers. Grey market keys for The Division 2 are still fair game and can be picked up from the likes of CDKeys, G2A, Kinguin, etc. This move slices out the legitimate middle of the market and forces users to either pay full whack on Uplay or the Epic Store or else you're now actively encouraged to seek out shady resellers for cheaper keys. This doesn't look as if it's a tactic that's going to die anytime sooner either. Sweeney has doubled down on it, in fact, and said "Epic is absolutely committed to this path. Exclusives are by the far the most potent tool for our 88% revenue share making inroads against 70% stores." We've got a double-edged sword on our hands here then. Not only is Epic paying for exclusive games on its stores but it's also preventing game keys from being resold. This is remarkably similar to a console-style locked-down storefront and it's not exactly the best tactic to win the favour of PC gamers. It also demonstrates the considerable sway Epic has over even the largest publishers. Ubisoft is a goliath of gaming, and yet somehow Epic has laid down an iron fist and forced them to remove all keys in circulation. The level of money being thrown around for a deal like this must be obscene. That, or, well, Ubisoft is banking on this forcing people through its own Uplay store, rather than Epic, taking a full-fat 100% cut. In a slightly worrying portent of things to come, it turns out that Tom Clancy’s The Division 2 will not be available to buy from third-party stores after its March 15th launch. Once launch day hits, all copies of The Division 2 will be pulled from retailers such as GreenManGaming, Humble and GamesPlanet, and the game will only be purchasable directly through Uplay and the Epic Games Store. An update on The Division 2’s store page on GamesPlanet says “Sadly we have to announce you that Ubisoft will not allow digital third party stores, such as Gamesplanet, to sell Division 2 after its release on March 15th 2019. After this date, the game will digitally only be available through Ubisoft's Store and another exclusive digital store. This will also be true for all upcoming game content such as Season Pass, Extensions, etc. Any support requests will not be able to be handled by third-party stores as they’ll no longer have keys to swap, so all issues will need to be taken up directly with Ubisoft itself. “Obviously, we are not happy about this decision,” says the GamesPlanet team. However, all pre-orders for The Division 2 will be honoured at the retailer of your choosing. Taken in isolation, this isn’t a massive issue. When we think of the bigger picture though, this paints a problematic scene. One of the strengths of PC gaming is arguably its open nature and competing storefronts. The more isolated each store becomes, and the stricter the handling of accounts and keys, the more of a stranglehold the store will have on their customers. Under these conditions, literally the only way you’re going to be able to pick up The Division 2 for a discount is if Ubisoft runs an official sale on uplay or the Epic Store. This could put digital games in a markedly weaker position than physical retail, where market forces can determine discounts. We would love to hear your thoughts on this one. Do you often buy your keys for third-party stores? Can you see more publishers tightening up on CD key sales? Could this be the work of Epic? Let us know what you think! As a form of retaliation. I'm just going to buy it for next year. If most people do. they will think twice before taking these actions. A bit childish if you as me going this route. They could've easily made more money by going third party also. It's bad enough with platform exclusive games, now we have to install a bunch of launchers for different type of game. While not a disaster, its pretty irritating for the consumer and does more harm for the game than anything. I dislike most of the launchers out there, best to use something like Launchbox, its nifty! At this rate you'd better off buying the game in Uplay. Quick!!! Someone report this to the FTC (Federal Trade Commission) and European Commission. Of course they were paid. So correct me if I'm wrong but Epic is trying to fight Steams monopoly… by building a monopoly of their own? How does this help us, the consumers, exactly? Monopolies are only bad when others try doing it. But when Tim does it - it's ok! 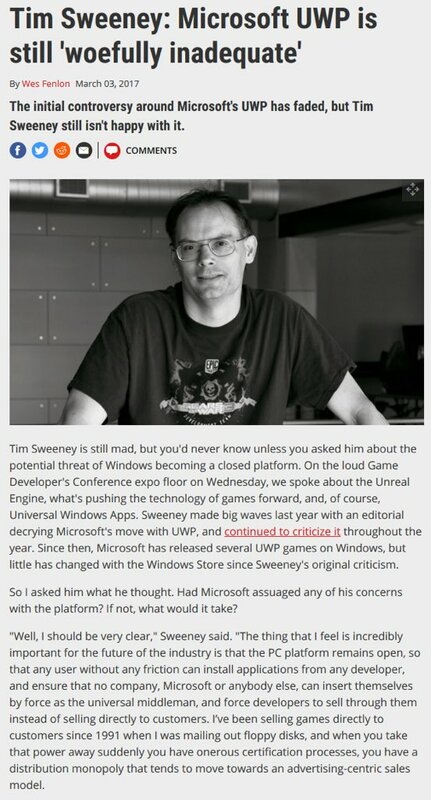 He also said that PC gamers are a bunch of pirates and that the consoles (xbox in particular) are the future of gaming - back in '08 or around then. The man is the living embodiment of hypocrisy. Ye, he's a dickhead now. Him and Carmack were fps grandfathers and these genius tech brains… I can only trust Carmack now. It's funny when I hear console gamers are not pirates, since the person who pirates also cracks the consoles. Lol!